Indeed Indie | It’s Only Humpday, but I’m Still Excited!! Filed Under Films, Humpday, Vinyl, Volcano I'm Still Excited!! Starring mumblecore pioneer Mark Duplass, as well as Joshua Leonard and Alycia Delmore, the film stays true to the movement by employing the use of lo-fi filming equipment and techniques to provide a more authentic glimpse into the lives of today’s young adults. The script was even thrown out during some scenes, as actors opted to improvise dialog in order to make the film appear more realistic. 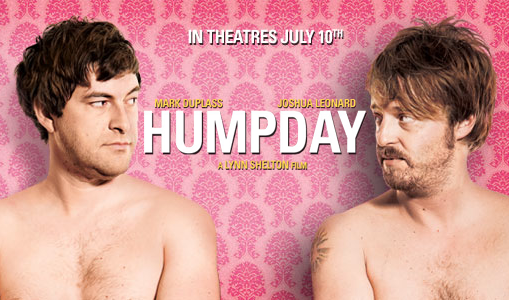 Having premiered at the Sundance film festival to high acclaim and winning the Special Jury Prize for the Spirit of Independence, Humpday was picked up by Magnolia Pictures and released nationwide. The movie is currently playing at Landmark Midtown Art Cinema in Atlanta. Prior to becoming an actor and director, Duplass was in the Polyvinyl band Volcano, I’m Still Excited!! Yes, the two exclamation points are part of the band name. Though the group disbanded several years ago, fans of Volcano, I’m Still Excited!! have called upon Polyvinyl to reissue their lone eponymous release. The record label is currently raising the funds necessary to press a limited edition vinyl LP. If you enjoyed the tracks above, I highly suggest pre-ordering Volcano, I’m Still Excited!! through the Kickstarter fundraising website.